After yesterday's Moroccan sandwich shop in Astoria, it seems fitting to stay in the same genre while switching country and borough. The word "torteria" on the awning drew me in immediately, the Mexican torta is not rare but usually shares the menu rather than being the main draw. I could not resist checking El Sancho out despite already being full from pizza and gelato nearby. The menu reads differently than imagined from the outside though, a modern design shows sections of tacos and juices as well as hamburgers and western breakfasts. Tortas El Sancho is trying to toe the line. 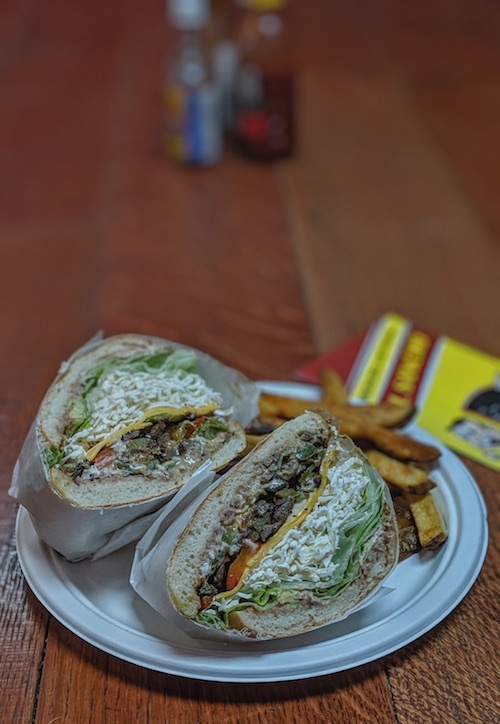 There is a section of what they call tortas combinadas, six creations that all cost an eye-opening $13.07 after tax. The first of these options is called El Sancho (above and below), the base of which is sauteed steak with red and green peppers. 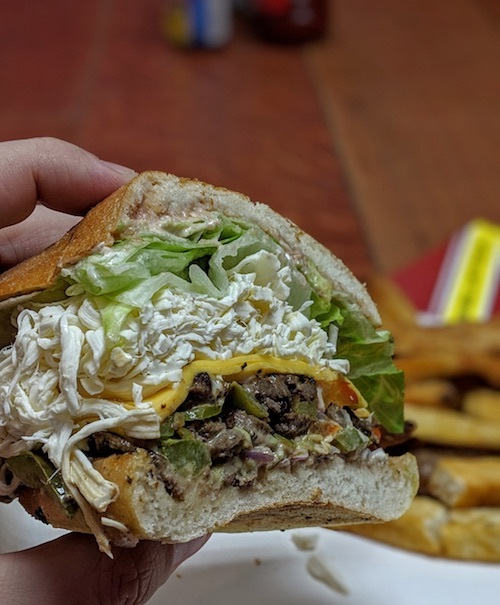 Besides some normal ingredients for tortas, they also throw in a slice of American cheese which surprisingly can be picked out easily while eating and just seems odd. As seen below, a small portion of fries is served with the sandwich, another cross-cultural mashup. For the first time in my life I was asked if I needed ketchup in a Mexican restaurant.